Gumball is back. This week, Cartoon Network announced they’ve ordered a sixth season of the series The Amazing World of Gumball. 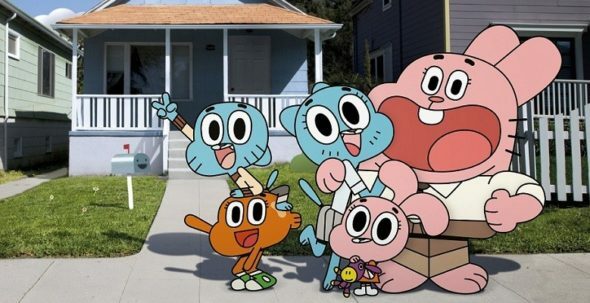 The hybrid animated/live-action series follows the adventures of 12-year-old cat Gumball Watterson and his family. The show has been nominated for five Annie Awards since its premiere in 2011. Season five of The Amazing World of Gumball premieres this fall on Cartoon Network. The multiple award-winning series has scooped 28 international awards to date including six BAFTAs and an Emmy(R). Production began this month at Cartoon Network’s EMEA studio, Great Marlborough Productions, in Shoreditch, London. Season five is slated to begin airing from September 2016 internationally and is set to premiere next year in North America. Now in its fourth season, The Amazing World of Gumball cleverly combines live action with 2D and 3D animation to chart the adventures of the energetic and fearless blue cat – Gumball – and his idiosyncratic family, the Wattersons. The series is created by Ben Bocquelet, executive produced by Sarah Fell and series-directed by Mic Graves. The show reached more than 165 million viewers globally in Q1 2016. Additionally it has an increasingly strong presence across digital platforms, with the latest global mobile game launch Agent Gumball reaching #1 overall in the iTunes charts on iPad in five countries and #1 in the Kids category in 27 countries. Last year’s EMEA-developed app Rainbow Ruckus also ranked number one in the iTunes paid apps chart in 27 countries across the globe and was a top #5 paid app in 65 countries in its launch week. To date, Gumball has produced almost 7 million app downloads worldwide, attracted more than 9 million Facebook fans and has generated 8 million views on its YouTube channel this year alone. Added to this, awareness and affinity among the channel’s core audience is at an all-time high and is growing among girl audiences too – in other words, kids love it! What do you think? Do you watch The Amazing World of Gumball? Are you glad it’s been renewed? More about: Cartoon Network TV shows: canceled or renewed?, The Amazing World of Gumball, The Amazing World of Gumball: canceled or renewed? I just came across this article… I’m soooo excited to hear that this show is being renewed!!! I love this show, the characters, the writing.. it’s hilarious!! Keep ’em comin..